Welcome to Antiques & Moore! 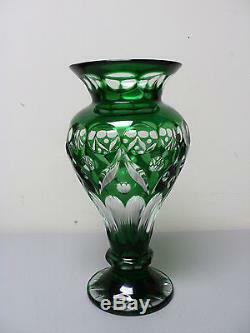 This listing is for a lovely antique emerald green cased overlay glass cut-to-clear large 10 vase, c. This great vase features a thick 3/8 glass body beautifully decorated with large round cut facets and unusual stylized leaf cuttings and deep starburst cutting on base. The vase is in excellent condition with no scratches, chips, cracks or repairs although there is some very light cloudiness on inside and surfaces scratches on base from normal use (see photos). This is a heavy, very high quality cut glass vase. Measures 10 1/4" high with a top diameter of 4 3/4", maximum width is 5 1/4" and the base is 4 1/8" in diameter. We at Antiques & Moore have been in the Antiques business for over 30 years and try to describe our items as accurately as possible. We are happy to answer any questions and always appreciate your business! The item "BEAUTIFUL ANTIQUE EMERALD GREEN CUT-TO-CLEAR 10 CRYSTAL VASE" is in sale since Friday, January 9, 2015. This item is in the category "Pottery & Glass\Glass\Art Glass\Bohemian/Czech\Other Bohemian/Czech Art Glass". The seller is "antiquesandmooresales" and is located in Hendersonville, North Carolina. This item can be shipped worldwide.